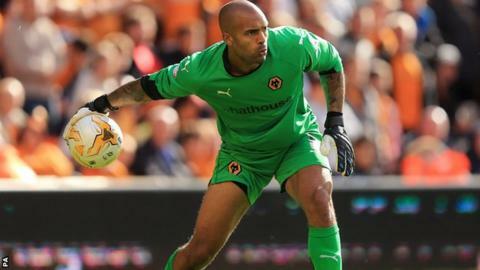 Wolves could be without goalkeeper Carl Ikeme for up to eight weeks following a training ground injury. Ikeme, 28, has broken the second metatarsal bone in his left foot after colliding with team-mate James Henry. Ex-West Bromwich Albion and Manchester United keeper Tomasz Kuszczak will take over in goal, starting with Saturday's home game against Reading. "It's one of those things that happen in training. A block tackle with James Henry," boss Kenny Jackett told BBC WM. Tomasz Kuszczak first arrived in English football at West Bromwich Albion, when he was signed by Bryan Robson from Hertha Berlin in the summer of 2004. He has since played for Manchester United, Watford (loan) and Brighton & Hove Albion. "It will be a loss, because Carl's been a big player for us, but it's also an opportunity for Tomasz Kuszczak. And it's the reason he's here, to cover situations like this. "He's been with us a couple of months and he's ready to go. He wants to be a number one keeper again and has been frustrated at not getting such opportunities." The 32-year-old Poland international, released by Brighton last summer, joined Wolves on a short-term deal in November after reserve keeper Aaron McCarey was ruled out following back surgery. Kuszczak then signed a new contract in mid-January to keep him at Molineux until the end of the season. Ikeme's injury is his third fracture in successive seasons, having twice broken his hand.